The Math Union will be hosting our first talk in this year’s series on Monday, September 26th from 4-6pm in BA1220! Professor Kumar Murty, the chair of the University of Toronto Math Department, will be talking about number theory and cryptography in an accessible talk aimed at undergraduates. If you’re interested in number theory, cryptography, a great lecturer, and/or free refreshments, come and see Dr. Murty’s talk! Click here to see this event on Facebook! The Math Union is looking for students to fill officer positions. If you are interested in getting involved with the organizational side of the Math Union, please submit an application through this form. We are looking for 2-3 officers in each of the following positions. Submissions will close September 30th at 11:59 pm. -Communications Officers: should be students who are interested in exploring ways the Math Union can better connect with students — they should be comfortable composing a well-crafted email and making effective posts on social media. Although not a requirement, any experience in web design or WordPress is also an asset. -Academic Officers: As an academic officer, you will participate in the planning of academic talks and other academic events which may include room booking, contacting professors, and assisting with the purchase and distribution of refreshments during events. Skills required are reliability, good communication skills, and knowledge of good food places. -Social Officers: We’re looking for individuals who are motivated, adventurous, creative… and above all, interested in event planning. Types of events including: Semi-formals, fundraisers, career development workshops, inter-disciplinary panels and etc. Previous experience is not necessary. Include any relevant skills or experience (such as photography, musical talents) in application. A very flexible 1-2 hr /week, on average. -Designers: Our designer would like some help creating all our beautiful posters and banners. Experience isn’t necessary, but Adobe Illustrator is a huge plus! Are you interested in math competitions? Do you like free pizza? If you plan to attend, please register at http://uoft.me/putnam-register so we know how much pizza to order. As part of the info session, we will have a practice test that we will use to invite some students to more advanced sessions. 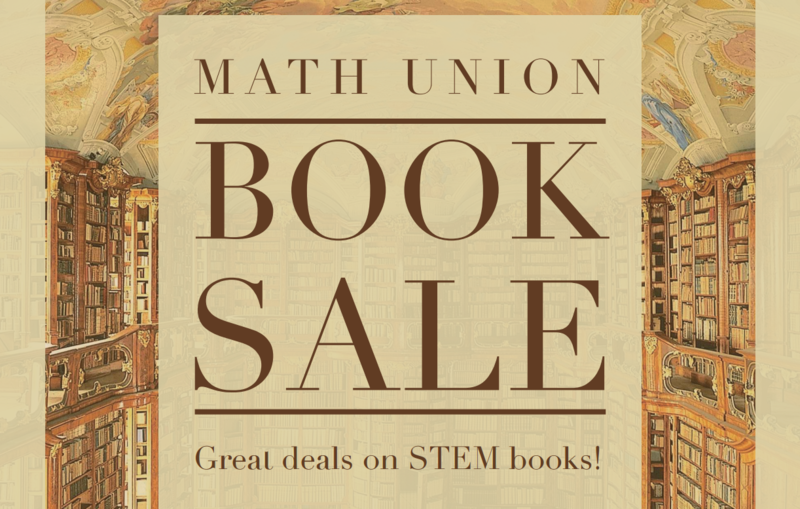 Come check out the Math Union’s official book sale on September the 16th in the Bahen Atrium from 10am-4pm! Come by and get a great deal on a math book or twelve — we have everything from textbooks to sci-fi novels. Click here for a catalog of what will be available on a first come, first served basis. 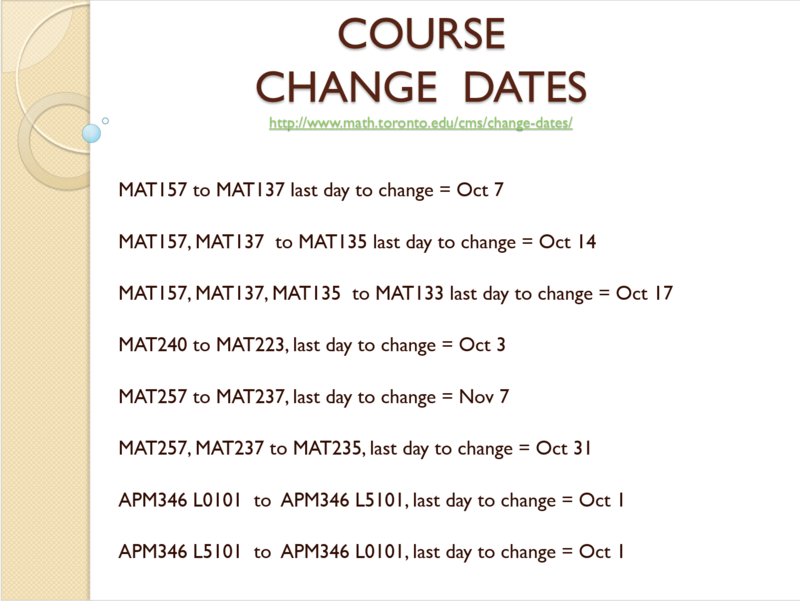 The department has announced the official course change dates for courses in the fall semester! For additional details, see the department’s website. The Math Union will be holding its book sale some time in the first week of classes. Fantastic deals guaranteed on all kinds of books, from STEM textbooks to scifi novels. For a small preview, here’s what we’ll have in stock. See if there’s anything you’re interested in here.